I recently received a request to blog about Study Bibles. Note that this not the same as Bible study, but instead I am addressing the different kinds of Study Bibles that are available to those who wish to study the Bible with a little depth. 1. Study Bibles are an important part of your Bible reading and devotion regardless of where you are in your maturity level as a Christ-follower. 2. Every Study Bible has a bias of some sort, just as every translation does. 3. People should have more than one Study Bible to reference. 4. A good Study Bible will have notes, introductions to books, cross reference columns, a Bible dictionary, and most importantly a weighty concordance. 5. Buy hardback Study Bibles for your personal devotions, but do not make your everyday Bible a Study Bible. 6. Most of these now have apps for your digital devices as well as online updates and added content. I recommend separating your Bible everyday reading Bible from your Study Bible because sometimes the notes get in the way. Studying the Bible is important, but reading the Bible is the key to spiritual enlightenment. Keep the Study Bible(s) for referencing later if you have a specific question or are moved to do further study on a passage. I find that this is true for small groups as well. It is annoying and tedious when, in a small group study of something, a person hijacks the group by saying, “Well, my Bible says . . .” and then he or she begins to read directly from the notes in his or her Study Bible. Some people, I’ve discovered, treat the notes as if they are part of the God’s word, not differentiating properly between Holy Scripture and study notes. So for this reason, I recommend getting hardback student style editions of two or three Study Bibles but spend the extra money on a nice leather bound volume in your favorite translation for everyday use. Or, if you’re like the sprouts, just read the text off of your iPad or iPhone for your daily reading. Although there are almost an infinity of different Study Bibles, only a handful or so warrant description here. I have grouped them for your reading pleasure. The Old Timers: There is a trinity of older Study Bibles that are still, amazingly, quite popular especially in conservative and fundamentalist circles. These are the Thompson Chain Reference, the Ryrie Study Bible, and the Scofield Study Bible. I still have my old Scofield Study Bible, bound with book tape, sitting on my desk with it’s odd notes and glorious King James vocabulary. It is the Bible I cut my teeth on, so to speak. These three Bibles are good, but they all have a very Dispensational bent to them that I find illogical. The Thompson Chain Reference is probably the most helpful of the three for general Bible study. The Study Bible 101’s: Most Study Bibles are designed as an introductory to the Bible. The greatest of these is probably the Zondervan NIV Study Bible. It has been around for a long time, is widely accepted across denominations, and seeks to answer the “So What?” question. The Life Application Bible is another one of these introductory texts. It is a little lighter than the Zondervan but that makes it more approachable. These are the Study Bibles that I would give to a high school junior or a new believer making good progress and asking good questions. Give Away to Goodwill: Avoid all Study Bibles that are 1) topic specific 2) single-author 3) based only on the King James Version. Topic specific Study Bibles are like the Archaeology Study Bible. I love archaeology and I love the Bible, but the Archaeology Study Bible is inconsistent on both accounts. Study Biblical archaeology with single volumes dedicated to that field, not with a Study Bible. Single-author volumes are incredibly biased. As for the KJV, well, those Bibles are written in Pirate. Greenbean’s Choice: There are two Study Bibles I keep going back to over and over again. The ESV Study Bible and the New Oxford Annotated Bible. If I had to choose one of these, it would be the ESV Study Bible. Both of these include superior translations (The ESV and the NRSV) and nice notes. The ESV, however, is the most thorough and well put together Study Bible on the market. It includes essays, charts, excellent notes, and a great concordance. The Oxford Bible is not as thorough, but it excels at ease of read and perspective. The ESV is a far more conservative (although, happily, not as Calvinist as I had feared) while the Oxford is not, so they balance each other out. You should have at least one good Study Bible, and probably two or more. I also recommend that you get them from the opposite ends of the spectrum. This provides balance. So, if you are a committed Dispensationalist (I will pray for you) I recommend balancing your beloved Ryrie with the Zondervan. In the same way, if you are a died-in-the-wool liberal balance your Oxford Annotated with the Thompson Chain Reference. If you think of yourself as really super smart, then perhaps when you study don’t just use that massive ESV Study Bible, pick up the Life Application as well and let it work at you for a bit. Balance is the key. Previous Post HAVE YOU FILLED OUT YOUR BRACKETS? I agree with you, Jamie! 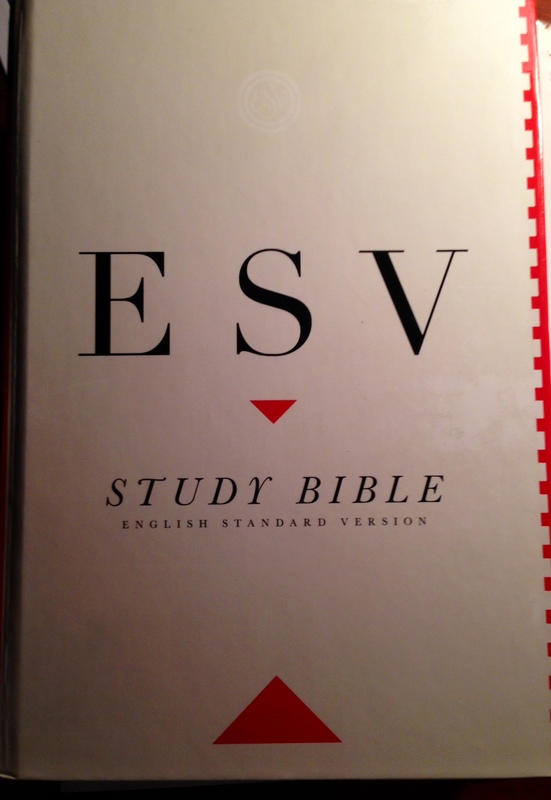 Recently, I started using the ESV study Bible. Love it!